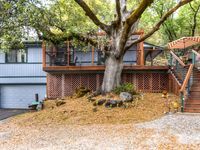 Cozy Placerville Cottage Getaway - 5 min away from Downtown. Away but close. Property 2: Cozy Placerville Cottage Getaway - 5 min away from Downtown. Away but close. 'Avery House' Pollock Pines Cottage w/Hot Tub! Property 3: 'Avery House' Pollock Pines Cottage w/Hot Tub! Property 7: Rustic Pollock Pines Cabin w/Large Deck Near Lake! Lagunita- lakeside cabin w/ 2 bunkhouses & HOT TUB! $225..Per night for all 3!! Property 9: Lagunita- lakeside cabin w/ 2 bunkhouses & HOT TUB! $225..Per night for all 3!! Property 20: NEW! Cozy El Dorado County Cabin w/ Loft & Deck! Absolutely perfect place on Chiquita Lake. Slept 13 of us (6 adults) spaciously. Beautiful views and has all the amenities you need.